Peruvian food stands out from today’s popular food trends, but its origins date back to the 12th-century Inca Empire. If you’ve ever studied Andean cultures, you’ll be familiar with the mystery surrounding the Inca. What does a thousand-year-old culture have to do with today’s popular foods in Peru? The answer is: a lot. You’ll be surprised to learn how Inca farming techniques influenced Peruvian dishes. Mystery or not, you’re eating history when you enjoy Peruvian foods. The Inca people followed a unique style of farming and agriculture. This is because they lived high up in the Andes mountains. This unusual location meant that they couldn’t raise cattle and had to depend on plants. Luckily for them, these people were highly skilled at farming. They used terraces to water their crops and raised llamas and alpacas for meat and wool. They planted amaranth, peppers, maize, and potatoes. Quinoa, zapallo, and maca also became staple ingredients in their diet. Besides vegetables, the Inca people ate plenty of fruits and nuts. They also ate meat from frogs, deer, and guinea pigs. The poor sometimes ate insects like beetles and ants to get more protein in their diet. Eventually, the Inca Empire expanded to the coast and people were able to add fish to their daily meals. They learned how to fish from the tribes they conquered. Even in a harsh location, the Inca people learned to develop their skills. They also harnessed the power of their natural surroundings. They became masters of smoking and drying meat by using the cold mountain slopes and high altitude. Even after the Spanish conquest, this knowledge remained. Although the Inca people left no written documents, their history survives in today’s Peruvian food. Traditional Peruvian foods have three sources: the seaside, the mountains, and the rainforest. The ingredients used in modern Peruvian meals are similar to those used by the ancient Incas. Amaranth, maize, and yuca are still a source of grains. Peppers like Peru’s rocoto pepper are still used to add heat to recipes. What’s more, there are dishes that have been passed down the ages and still cooked today. Roasted guinea pig is a special meat that has been enjoyed for thousands of years. Another recipe, called chuño, uses freeze-dried potatoes and feeds Andean highlanders today. Did you know that there are 3,000 kinds of potatoes grown in Peru? Don’t worry–this doesn’t mean you’ll only be eating tubers when you visit. Meat has become a Peruvian staple and locals enjoy alpaca, chicken, and pork. 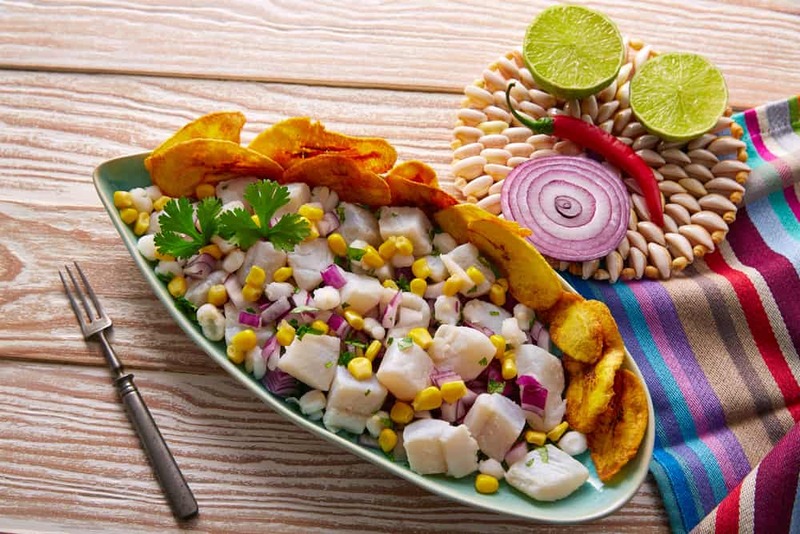 Another famous dish is Peruvian ceviche. It’s made with raw fish marinated in lime juice, onion, and chili. Some recipes add on corn or cilantro, but every Peruvian family will have their special twist on it. Even ancient recipes like this one are enjoyed by today’s Peruvian population. Although Peru’s modern dishes have a wider variety of meat and seasonings, the essentials remain the same. Staple Peruvian foods and Peruvian recipes can be traced back thousands of years to the Inca Empire and their mountain domain. Today, Peru is the birthplace of potatoes and an attractive place for travelers to try an ancient cuisine. Curious to try a traditional recipe today? Try this easy Peruvian potato dish for dinner.